The Castle School of English | Edit Blog Why do we love Brighton? Why do we love Brighton? Castle School has fantastic students who study English in Brighton. We asked them why they love Brighton. These are some of their answers. Why do you love Brighton? Different people decide every day to come to UK for the language, but it's hard to find a good place where everyone can feel at home. Brighton is this kind of place. Situated in the south of England, it's very close to London and efficiently linked with many attractive places. Being directly on the sea, Brighton offers spectacular views of the coast with its seafront and from its hills. In relation to nature, living here is absolutely amazing and the weather is not the typical English weather. Enjoying the sun near the sea gives the opportunity to "unplug" from the stress of daily life, calm down and relax. 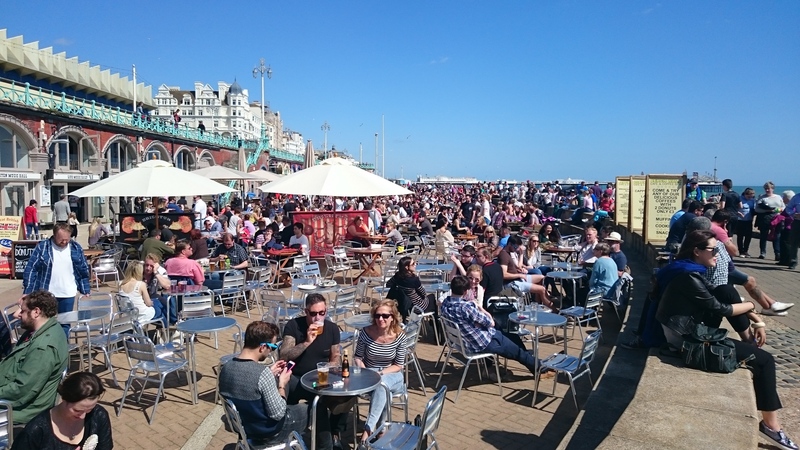 In contrast, Brighton has a very exciting nightlife with pubs, restaurants and several places where you can spend and fun your evening time, generally. Coming from all around the world, people mingle with each other’s their cultures. This colourful city is also represented by a wide variety of food, in fact having a look to the main roads we can find several and alternative cuisines. English people here are very open-minded and friendly, and this is extremely important in a mix of cultures like in Brighton. However, English is crucial for a language student like me, I put a great stress on studying in a place where the English language has a proper accent in the East Sussex and people speak with a clear accent called "pure English". It has been relatively easy to find a school of English in Brighton, and I'm glad about my choice. I found a very friendly environment where people come from different parts of the world. It's a dynamic school with lovely teachers, interactive lessons and valuable proposals for afternoon and evening activities. It doesn't matter if you work in team or on your own,your English will improve quickly in this context. Living in Brighton is not just a simple choice, but it's a good opportunity. Brighton is an English seaside resort town and it is an hour away from London by train. Firstly, Brighton has a sea and Pier. These are the most famous things in the city. The sea means humid weather but swimming days as well. The perfect plan in Brighton is to go to the Pier in a sunny day, play some “arcade games” and walk on the seafront and finally, arrive to the “Fortune of war” to drink a beer. Are you hungry? Let’s have a Sunday roast, the typical Sunday dish. I recommend “The Lion & Lobster”. It’s very close to the Pier. Secondly, we are going to talk about the cliffs. Seven Sisters in an amazing place to spend the day, do some exercise and enjoy the landscape. If you are tired, and you just want to take a ride, you can wander inside the second-hand shops in the Lanes, and eat a falafel. It’s a cheaper plan! Don’t you think so? One of the most important things in Brighton is that it is an open-minded city. People don’t think about what are you wearing and they don’t judge you. In the English classes, you could meet a lot people from other people and always speak in English. Brighton is a cool city, with good vibes and people from all over the world. I came to Brighton in 2015 and I stayed about three months. I fell in love with this city because everyone is open-minded and friendly. I studied English three months and I went back to Turkey. After I finished University, I came to study English again because i know that I can learn a lot of things in Brighton. The best way to learn English is by interacting with local people and if you go to some local pubs, just have a drink and chat with polite people who will welcome you, you will have a lot of news about English culture. Also it’s very difficult to get bored here. You can ride a bicycle in the nice weather by the sea, have some fish and chips and watch the view of the long deep ocean or socialise with international students who came to learn English. If you want to learn English you should come to Castle School. You can study with experienced teachers and students who come from all around the world. You can't imagine how much your perspective will change. Brighton is a city of mixed cultures. It was the third time for me in England but I’ve never been to Brighton before. Now, at the end of my summer experience here, I want to write something about this city. After two weeks I think that Brighton is a city with a lot of activities to do in your free time, especially if you are a teenager and you want to have fun. There are a lot of places you could go to like: Zip line, laser zone but also on the Brighton Pier there are a lot of carousel rides to choose from where you could spend your free time. But if you prefer to have a relaxing day you could have a day at the beach where you can play volleyball and you can get some sunshine. In addition you can stay in the city where there are a lot of shops especially in Churchill Square that is one of the most important squares in Brighton. At the school you have the opportunity to meet a lot of people from all over the world, like Spanish, Turkish and Italian. Castle School organises some trips for students as well to get to know Brighton. A convenient thing is the fact that the city is very close to London. In fact, the school will organise to you also a trip day. In conclusion, for me Brighton is a very interesting city because people are friendly and open-minded and it is very good for all the people that come from different parts of the world.